Not another ethics sub-discipline, please! Who needs one more microscopic parasite piggy-bagging on the shoulders of working people? From bioethics to business ethics, from media ethics to military ethics, from neuroethics to nursing ethics, every letter of the alphabet is well-represented in this rat-race for whatever crumbs of funding the grown-ups leave behind. And if you really must, can’t you do better than a cheap escalator joke turned presidential campaign turned shutdown turned ‘national emergency’? And yet: we have gone from one implausible Republican President begging the Russians to tear down this wall, Mr. Gorbachev to another beyond-the-last-outpost-of-possible-world-semantics Republican President being begged by everyone but the Russians not to build the wall. Wall ethics is complicated indeed (if you are a Republican anyway). And from the Romans keeping out the Scots to Jon Snow keeping out the dead, walls do have a complex history (wait, Game of Thrones is fiction? Nobody tell the President). Think about it though: for all the outrage that has been rightly focused on the southern barrier – the real world is literally upside down – two much more consequential defenses play the opposite dialectical role in current debates. The first is GDPR, the EU’s General Data Protection Regulation –and yes, there already is such a thing as data ethics, don’t you worry. Those rightly outraged by the southern barrier are often just as outraged – and just as rightly – by the US lagging behind Europe on this crucial challenge of our time, data and privacy. In fact Trump gets just as much grief for his wall fantasies than for his exposing democratic processes to Russian cyber-interference (let’s not forget Facebook’s complicity either). So the problem is not that he wants to build a wall; the problem is rather that he wants to build the wrong one. Data protection is not the only example: a possibly more formidable challenge is antimicrobial resistance - the increasing powerlessness of antibiotics - which makes preventing and containing infectious diseases at the same time more difficult and also more urgent. Enter the wall, this one for real: Denmark is building a 70km-long southern barrier - along the border with Germany - to protect its precious pigs from German wild boars, those rapists who threaten to bring ASF (African Swine Fever). Given antimicrobial resistance, it is not implausible that a physical barrier would constitute a more sustainable and forward-looking strategy than abusing antibiotics. When it comes to information and health, might defensive barriers be the civilized solution? Trump most certainly has the wrong answers, but could it possibly be that he is asking the right questions? This disturbing thought gains further traction when we add climate change to the equation: transportation – of people and goods – is the biggest contributor to global warming, according to the US own Environmental Protection Agency. What have we just done, methodologically speaking? We have taken today’s most outrageous idea – by one of today’s most disgusting representatives of the human race (or is he? Human, I mean) – and have shown that a bit of reflection quickly brings out some not-so-surprising complexities. This – I believe – is what ethics is good for: not as a service provider of guidelines; the direction that a lot of the sub-disciplines are unfortunately increasingly taking, in order to justify their existence and hope for the next funding crumbs. Multiplicating guidelines by tweaking, say, the four principles so that they apply to the newest sub-discipline ( One Health ethics , anyone?) is neither very interesting nor what our ‘customers’ actually need (even though they might not know it themselves). At the antipode, ethicists are also not at their best, I believe, as hyper-normative do-gooders – even though the long-term potential of this latter task ought not to be underestimated, in the spirit of Kant’s perpetual peace. As my colleagues Thomas Schramme and Marcus Duwell have argued in their first editorial as Editors-in-Chiefs of ETMP,1 hyper-normative do-gooders have a tendency to over-simplify empirical realities (or just not read the relevant empirical literature, never underestimate the laziness of philosophers) which must be discouraged; you don’t have to be a catholic atheist to be skeptical of good intentions. What’s left for ethics to do, then? The boring work of disentangling conceptual and empirical complexities, even when they pop up from a most unexpected source.2 It won’t get you many twitter followers or the big bucks, but somebody’s got to do it. Following the tradition that Marcus and Thomas have inaugurated with that editorial, here I won’t summarize the contents of this issue. 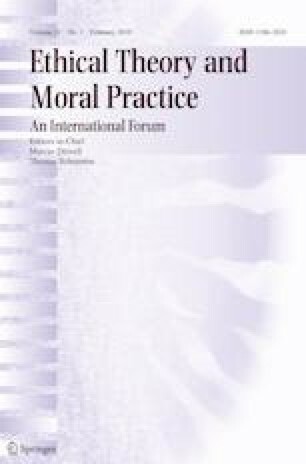 Still, I’d like to emphasize a couple of articles: Hanno Sauer’s, reacting to Buchanan & Powell’s book The Evolution of Moral Progress – the same volume is also reviewed in this issue by Marie-Luisa Frick. And also David Lawrence’s article on discrimination, religious freedom and homophobic bakeries. Without taking ourselves too seriously either: it’s not like we are in the life-saving business, after all – at best, our students are.